Discussion in 'Football Forum' started by Snowle Gunnar Solskjær, Jun 18, 2018. What a man, how dapper does he look? Look at that passion. The hero we never knew we wanted. Who knew the worlds most boring looking man could be this great. Best England manager in my lifetime. I really like him. He's doing a good job. I never had high hopes for him, but I must admit I'm a big fan now. 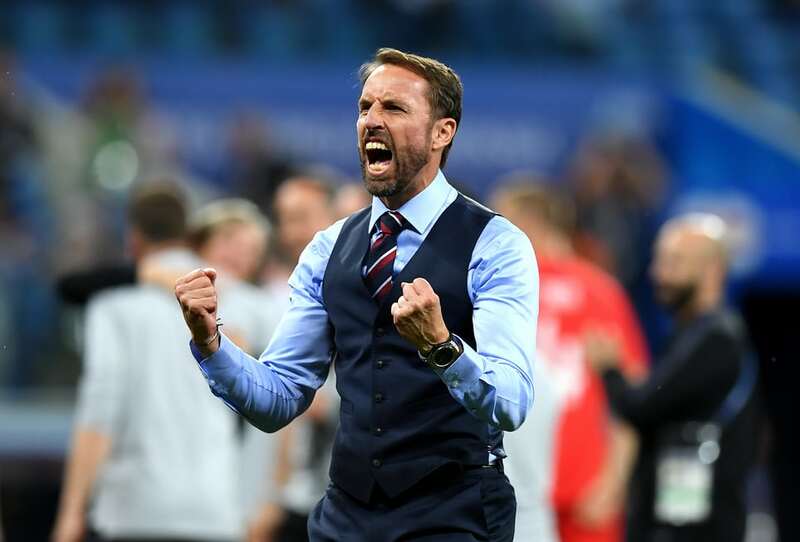 I think he talks a lot of sense, conducts himself very well, comes across as being very passionate and professional, and he's done a really good job in the build up to the world cup. I'm impressed with some of the decisions he's made too, especially how he didn't muck around in getting rid of Rooney and he's not brought players in to the squad on reputation. Feels like the most suitable England manager since Robson. Why didn't he sub Alli? I liked his waistcoat. Was hoping he'd pull out a pocket watch to check how much time was left. The criticism of him has rarely been about our performances. He's been fine, so far. That would have been epic. Missed opportunity. I came here to post the same thing - Alli was a complete passenger from the moment he took a knock, it was like playing with 10 men. No doubt Alli wanted to play on regardless because it's the first game of the World Cup, but Alli's selfishness and Southgate's cowardice almost cost the team. Southgate had to see that he was just walking around the pitch and pulling out of every challenge and subbed him. It made a very noticeable difference when Loftus-Cheek came on and suddenly we weren't just playing with a one man central midfield (Henderson). Distinct lack of Gareth Southgate in this thread. What? After he walked about the field 50 minutes injured? He beat Man City 8-1. Jokes aside, he's actually doing a very good job so far. Eager to learn from mistakes and try new tricks or systems, not clueless or persisting on one trick. That surely doesn't mean England will challenge for this World Cup but for the first time I actually don't think they'll get themselves embarrassed. Found him irritating but really seems like a likable guy. Hope he does well for England. No goals scored from open play (two goals from corners). Slow to react with substitutes or formation changes. Who cares. SGE and Capello were excellent at club level - strange time to throw unwarranted criticism at him. How did he land the job in the first place? Deep down, we're all a bit of Gareth Southgate. Yet, somehow, there still isn't enough of him...What a, I don't know. "Man" feels a bit belittling for someone like him. A God? Yes, that feels right. Did a decent job with the under 21's. For the first time we have a manager who has a plan for the future of the England team, not just the senior team but the younger teams as well. This is a long-term project, while the last few managers have been quick fixes who pandered to big name players. As long as he's not found out against Panama, a lot of us will accept this. Pizza hut should name a pizza after him. That really won't be his fault. Lukaku, De Bruyne and Hazard against any England defence imaginable is not a fair fight! I don’t get why the odds for Belgium and England are so close in the market. How would getting beat by a comfortably better side mean Southgate has been found out? He was a United fan as a kid. That's always a plus. Depends on the manner if the defeat? Where the feck did I criticise him? Because there's not a lot of difference in quality between the two teams.